Cat 320C excavator loading a Volvo A30G articulated truck. MGI Construction is more than an earthmoving contractor. Besides the company's excavation and earthworks division, they also have divisions that do heavy civil and site services, demolition and abatement, and asbestos and remediation work. The four divisions integrate to offer full-service packages that track development projects start-to-finish. Based out of Etobicoke, Ontario, the company has been around for close to 10 years now, has completed construction projects of various sizes large to small, and owns more than 100 machines and attachments. Safety is one of the company's core values. Earthmoving contractors are under pressure to move material at the lowest cost per ton while meeting schedules. 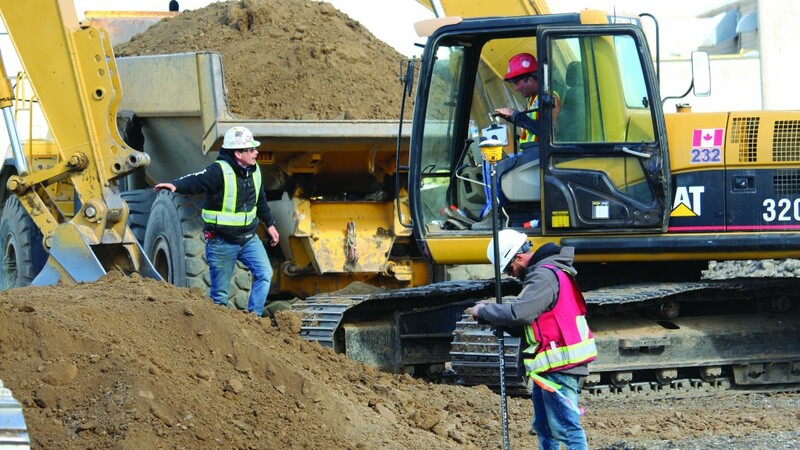 In order to develop an effective plan, they need to calculate how much material needs to be moved, the type of soil, what equipment is necessary, labour needs, schedules and more. Lou DeVuono, site superintendent, MGI Construction, says it is important to "choose suppliers in close proximity. Having material readily available is key to getting a project done on time." MGI did a survey of what is on site, what needed to be avoided and what needed to be removed. "This project was previously used as a staging area," says DeVuono. A construction company had set up their trailers, equipment and building materials there while they repaved Mainway Road, which runs on the north side of the Canada Post property. "They had put down some aggregate base and asphalt, which we had to strip independent of the native soils, so it was a two-step process for a large area of the property." "We used a utility locating service to provide us with the general area where the utilities are located and then brought in a vacuum truck to daylight those utilities to verify location and depth and, in some cases, to verify size of existing services, such as the water main and sanitary service," says DeVuono. MGI Construction also tested the soil for contaminants. While non-contaminated soil can be hauled to any landfill, contaminated soil gets hauled to a different facility for treatment, which costs more. The Canada Post construction project required hauling 5,000 cubic metres of soil off-site. Initially, the company brought in a Caterpillar 320C excavator, a Volvo A30G truck and a John Deere 750G dozer to lower the north side of the property, which was at a higher elevation than the rest of the property. "Caterpillar excavators are easy to use and pretty standard across the lineup. An operator who typically works in a larger machine can get into a smaller machine and know how to operate it," says DeVuono. "They provide excellent visibility and are comfortable, too." MGI Construction prefers using a truck and excavator combo versus a scraper in order to excavate. According to DeVuono, one reason the company prefers them is because excavators are more versatile than scrapers and therefore offer more bang for the buck to a company with services as diverse as MGI Construction. "On a small site, it allows you to do your cut efficiently; you can do the cut with just one pass of the excavator and load it onto the truck," says DeVuono. "Scrapers generally outperform excavators and trucks when you are stripping a large amount of topsoil and then there is a long distance between the cut and the stockpile, such as on subdivisions or large commercial property development; in these cases, there is significant area for stockpiling material. "MGI Construction cut the site to subgrade. Then they either hauled the earth off-site right away or stockpiled it, depending on the availability of dump trucks. However, it is better to haul the material off-site right away if that is possible. "When you cut and haul, you are handling the material once. When you stockpile, you are handling the material twice – once when you stockpile it and then again when you haul it. So, there is an extra cost in stockpiling material," says DeVuono. DeVuono says their Volvo A30G has proven to be effective in both small and large projects for various uses from hauling dirt to demolition debris. The machine's six-wheel drive provides a great advantage in poor traction conditions, and that the faster travel speeds have led to greater production. It is also a very reliable machine with little downtime, which leads to increased production, he says. As the project progressed, MGI Construction brought in more equipment, including three more excavators – a Caterpillar 352F, a Hitachi ZX350LC and a Hitachi ZX135; a Caterpillar 730C articulated dump truck; two compact track loaders – a Kubota SVL75-2 and a Caterpillar 259D for site cleanup and to move materials around the jobsite; a Caterpillar 950M wheel loader for moving materials around the jobsite and loading trucks; a Caterpillar CS 433C single-drum roller; and a Wacker Neuson RTxSC3 trench roller. They used the Cat 352F and Hitachi ZX350 for bulk excavation. "The Hitachi 350 is a great mid-sized, general-purpose machine. Its versatility allows it to perform bulk excavation while also cutting out watermains. Although it is a smaller machine, it is still powerful enough to handle the heavy work. We previously used it on a bulk excavation project, which required removing 22,000 cubic metres of material. It demonstrated fast cycle times while being very reliable, allowing us to complete the work quickly. High production and low downtime are always a key factor in any machine choice." The company had to trench 550 metres so that the underground utilities could be installed and another 260 metres for the envelope of the building. The company used the Hitachi ZX135 for the footings of the building and the Hitachi ZX245 equipped with a bulking bucket – which is wider than a general-purpose bucket – for the majority of the trenchwork, but then switched to a trenching bucket – which is narrower than a general-purpose bucket – for the bottom of the trench. In order to meet grade quickly and accurately on construction projects, MGI Construction had purchased two John Deere dozers, an 850J and a 750J, equipped with Trimble grade control technology. They used the 750J to help bring the property to subgrade and for grading the parking lot, which envelops the entire building. "We find the John Deere dozers to be a little more powerful than the competition, while not being bulky. Some competitive machines of equal power are bulky, and this interferes with visibility. John Deere dozers have great visibility and perform very well," says DeVuono. By using grade control, MGI Construction could calculate more accurate estimates, which means less rework and therefore less time needed to complete a task. They also don't need to use grade stakes and, by viewing the information on the screen, the operator doesn't ever exit the cab in order to check the grade. "The Trimble system is excellent; we had very little difficulty setting it up and using it. The 10 surfaces we input into the grade control program are very accurate, and this has translated into less re-grading, and therefore we achieve greater production levels whether we are grading out gravel or cutting sub-grade or bulk pushing. Today, construction has tight timelines and you need to be as efficient as you can," says DeVuono.